This weekend was so busy. It was the first weekend my husband has had off in 8 weeks. He’s been going to school and working for the past 4 months, with only a a half a week off in between. Thankfully now his internships are done, and he has just a few more classes, an exit exam and his licensure test after the first of the year. Then he’ll finally be physical therapist, with a doctorate degree. I’m almost as excited as he his. We went out to the beach Saturday to relax and watch the surfers. The waves weren’t as huge as I thought they’d be after Irene passed by us, but they were still pretty big. We only waded in the very shallow water. Unfortunately there was a man, and an experienced surfer, here that lost his life from falling while surfing and hitting his head this weekend just south of where we were. He was a popular math teacher at New Smyrna Beach High School, and had 3 kids and a wife. I can’t imagine the heartbreak felt by his friends, family and students. On Sunday we cleaned up around the house, and then went out to pick up my son his first big boy bed. I can’t wait until it’s delivered and he gets to sleep in it. After his preschool today, I’m taking him by to pick out a new blanket or comforter. (He started preschool last week, he’s going Monday, Wednesday and Friday for half days.) He wants a Cars blanket, no surprise, he’s obsessed with Cars the movie. I wanted to thank everyone again from the bottom of my heart, for all the very kind words and donations to Owen’s fund when my sister-in-law unexpectedly passed. My BIL Bryan is doing well, he’s so strong. My husband admires and knows there’s no way he’d be able to keep his head together as well as his brother is doing. However healing is a long hard road, that will never be completed. He’ll always have the deep wounds on his heart that this tragedy has made. Sadly, one of the hardest things for my BIL now is cooking, it was something he and his wife loved to do together so much. I’ll also be putting together an auction for Jennie later this week for an OXO goodie basket. And now, the ribs we had last night. These are great ribs. This is my favorite way to do them. I included my homemade rub, but you could use any rub recipe. It’s really the grill that makes them so good. We cooked these on our old charcoal grill over indirect heat, low and slow. I added the BBQ sauce, Sweet Baby Rays, in the last 15 minutes of cooking. Make sure you don’t add the BBQ sauce too early, it will burn, and that’s not tasty. Preheat grill to 225 - 325 degrees. If using charcoal, use indirect heat by building the fire on one side of the grill. Use a meat thermometer to cook meat to 190-195 degrees. Cooking the meat to a higher temperature like this at low cooking temperatures will tenderize the ribs. In the last 15 minutes of cooking, add your favorite BBQ sauce. I’m with you on the busyness. It just isn’t slowing down! I’m glad that your husband will be wrapping up some of his commitments soon. 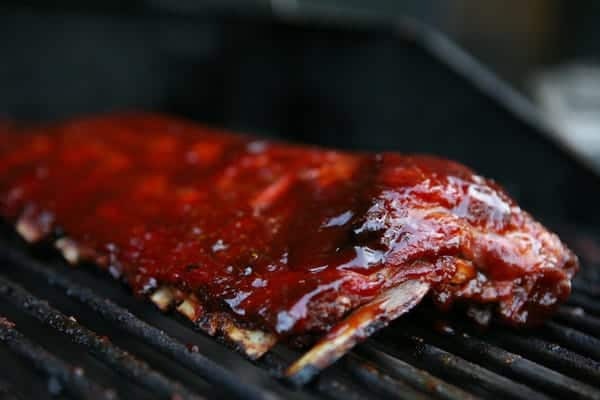 And thank you for sharing this delicious rack of ribs! I hope you are having a terrific Tuesday morning. I’m about to head off to work and begin my day. Much love and hugs from Austin! That is such a scary & sad story about that surfer. Approximately how much time on the grill?